Mar 19, 2018 by: Kristopher K.
We have some recent arrivals - A total of 6 units of Industrial salvage P.O. Mail Boxes Postal Mail Slot Units. These are Just Great ! Most all have the keys too ! Dec 9, 2016 by: Kristopher K.
You never know what unique great items are going to be in the shop. For example, how about this turn of the century Antique advertising stoneware whiskey jug crock growler. From WM. White & Son Wholesale Straight Whiskey House 18-22 Amory St Manchester NH. This is a rare find, and a nice historical local collectible item, of which are getting harder and harder to find. This is just one example of the hundreds of items that are in and out of the shop all the time. So just stop on by, because that great unique item you are looking for, may be here one day and gone the next. Apr 27, 2014 by: Kristopher K.
Here at Candia Road Antiques, we are excited to be able to be a part of another major motion picture film, by providing some great vintage pieces to be used on set. 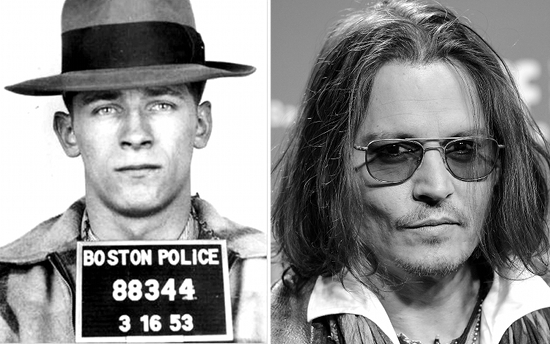 This time it will be for the movie " BLACK MASS " Starring Johnny Depp as James " Whitey " Bulger. It is being filmed in the Boston area starting this May. But, you don't have to be a movie set prop designer, to be able to buy the great quality items available here at the shop. There are always Unique new arrivals coming and going, as always... So come on down to the shop, you never know what you'll find. See pics below of some of the items, and look for them in the movie when it comes out. Candia Road Antiques - Barrister Bookcases New arrivals - Spring has finally Sprung ! Maybe ? Apr 18, 2014 by: Kristopher K.
Spring has finally sprung here in NH. Well... briefly anyways last week. But there is one place in New England where the weather has no effect on Great Things. Candia Road Antiques !!! Here in the shop there are always new, bright, exciting things going on, and new arrivals coming and going. Check out this selection of antique sectional bookcases AKA Barrister Bookcases, that have just arrived. There are some Globe Wernicke, Macey, and Shaw Walker. All are in awesome condition, ready for your book or curio collection. Come on down to the shop this weekend, we are open normal hours on Easter Sunday. Jul 11, 2013 by: Kristopher K.
Don't forget about the 2013 National Antique Bottle Show July 20-21. This year it's in Manchester, WOW !!! Also, Mark Your Calendar, this years NH antiques Week is August 2-10. While your in town, be sure to come out to Candia Road Antiques in the Countryside of Manchester, down by the lake. No worries About the Heat, The AC is ON and cranked UP !!! With different items coming and going constantly, you never know what you will find in the showroom. So come on down, we have plenty of free and easy parking in our own spacious parking lot. scroll down to see some new arrivals. May 19, 2013 by: Kristopher K.
Here at Candia Road Antiques Vintage Collectibles there is always an ever changining inventory of quality items. At any given time you never know what you will find. Things go Fast Here at the shop, so don't wait. Scroll the pics below to see just a small example of what is available now at your favorite NH antique vintage and collectible retail store.